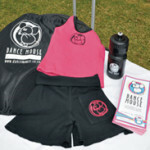 Dance Mouse is an activity designed to teach young children the basics of contemporary dancing styles. The DANCE MOUSE™ concept began approximately 9 years ago. Two highly experienced dance teachers Tamra Cawood and Genetia King who between them have over 70 years dance experience both run successful private dance studios and are prominent figures in the local dance world. Dance Mouse incorporates dancing and exercises aimed at improving both gross motor and fine motor skills. In an age where technology is taking over our lives it is vitally important that we get our kids moving again!!! Through dance, pupils learn to express themselves and through this their self-esteem improve. In a world where media plays a role in breaking self-image, it is vitally important that children are given a way to express themselves. The fitness, stamina and strength developed during dance class improves all other sporting activities. Including rugby!!! Statistics show that 51% of Grade 1 learners have moderate to severe learning problems. It is proven that structured movement patterns such as dance can help. This activity is outsourced and will take place on school premises, in the afternoon. Fees will be charged, to parents, for this activity. Grade 1 – 3 learners may participate. Dance Mouse runs from Term 2 to the end of the school year and students are required to attend once per week. The designated times and afternoon can be viewed on the weekly schedule of Extra murals on the school website.